Sixty K-12 educators from across the nation will visit NASA’s Johnson Space Center in Houston to test student-derived experiments in a simulated microgravity environment. Twelve teams of five educators will participate in the 2017 Microgravity University for Educators the weeks of April 2-7 and 9-14. The educator teams represent 14 states and one U.S. territory. The states are Arizona, California, Idaho, Illinois, Iowa, Minnesota, New Jersey, New York, North Carolina, North Dakota, Ohio, Oklahoma, Pennsylvania and Texas. The U.S. territory is Puerto Rico. The educators will test a student-derived Satellite Launching Experimental Device on the Precision Air-Bearing Floor in the Space Vehicle Mockup Facility at Johnson, while videoconferencing with home campuses. The Precision Air-Bearing Floor has a smooth metal surface that allows large objects to be moved as they might in space by way of tiny floor-facing air jets. 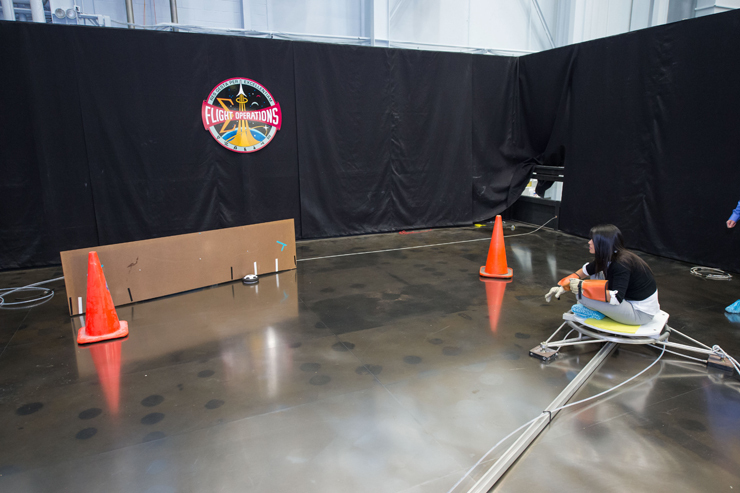 Through a competitive process, the teams submitted proposals to perform mock orbital insertion experiments on behalf of K-12 students using Johnson’s unique astronaut training facilities. All experiments involve solutions to technical problems identified by NASA scientists and engineers who use simulated microgravity environments in their work. Media interested in covering the event must contact William Jeffs at 281-483-5111 or william.p.jeffs@nasa.gov by 5 p.m. CDT on Friday, March 31. Follow all of the activities at #NASAMgUE.